The lecture aimed to discuss where does the term Latin America comes from, who are the Latin Americans? Is Latin America a part of the Western World? What are the similarities and the differences between Spanish speaking and Portuguese speaking Latin Americans? What are the similarities and the differences between the diverse Spanish speaking Latin American countries? Why did the United States and Latin America take a different path? Can we speak of Latin America and the Caribbean region as a single entity? All these questions aim at providing a general but comprehensive overview about that region of the world. The lecture was presented by Alfredo Toro Hardy. 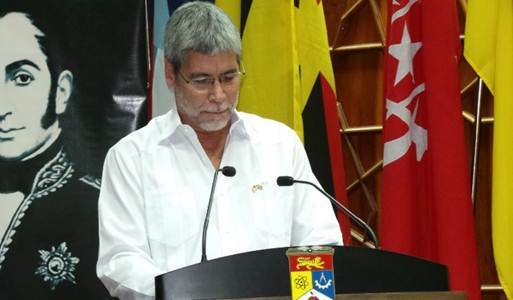 He is the Venezuelan Ambassador to Singapore since 2009 and former Ambassador to the United States, the United Kingdom, Spain, Brazil, Ireland and Chile as well as former Director of the Diplomatic Academy of the Venezuelan Ministry of Foreign Affairs. He has been a Member of the Advising Committee of the Diplomatic Academy of London, a Fulbright Scholar, a Rockefeller Foundation Bellagio Centre Resident Scholar, a Visiting Professor at the universities of Princeton and Brasilia and an on-line Professor at the University of Barcelona. 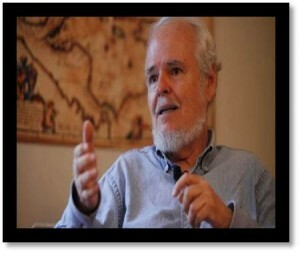 He was Director of the Centre for North American Studies and Coordinator of the Institute of Higher Latin American Studies at the Simon Bolívar University in Caracas. 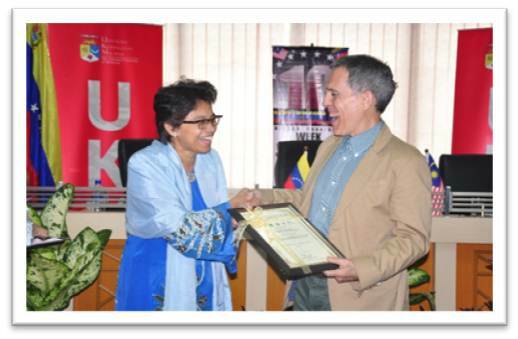 He was elected by the University Of Cambridge Council Of Faculties as “Simon Bolívar Chair Professor” for the period 2006-2007, but had to decline due to his diplomatic career. He has authored or co-authored thirty books on international affairs. His latest book dealt about the complex economic partnership between China and Latin America and was published in 2013 by World Scientific under its Series on Contemporary China. Two of his works received awards at the Expo America Book fairs celebrated in Chicago and Los Angeles in 2003 and 2008, respectively. He has also authored more than thirty papers on international affairs published in reputed academic journals. 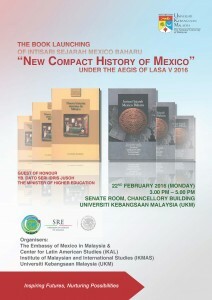 Chancellery Building, UKM February 22, 2016 – iKAL, IKMAS launched Intisari Sejarah Mexico Baharu at the Senate Room, 5th floor, Chancellery Building, UKM under the aegis of LASA 5 which will be organised on the 10th till 12th October. 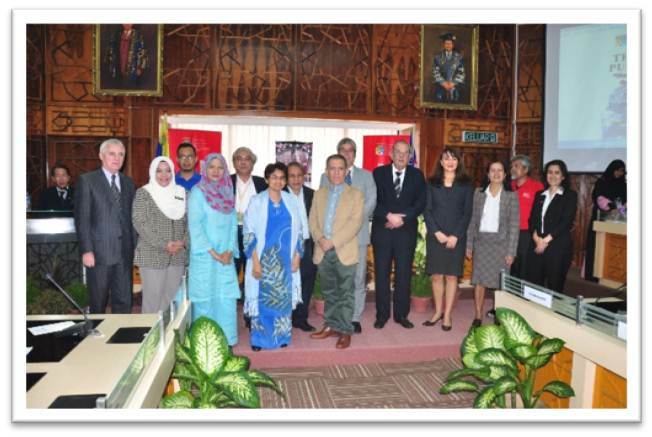 The event opened with warm welcome from Prof Datuk Dr Noor Azlan Ghazali, UKM Vice Chancellor. His Excellency Carlos Isauro Felix Corona, Ambassador of Mexico also gave his address to the launching of the Intisari Sejarah Mexico Baharu. The Guest of Honor YB Dato’ Seri Idris Jusoh the Minister of Higher Education applauded iKAL, IKMAS efforts to translate and publish literary works from Latin America. YB Dato’ Seri Idris Jusoh also congratulated iKAL, IKMAS for its collaboration with Mexico and called for further fruitful partnerships. The event proceeded with book review of the book by Prof Dr. Roberto Breña from Centre of International Studies of COLMEX on Neuva Historia Minima de Mexico. This followed by Book Review Intisari Sejarah Mexico Baharu by YBhg. 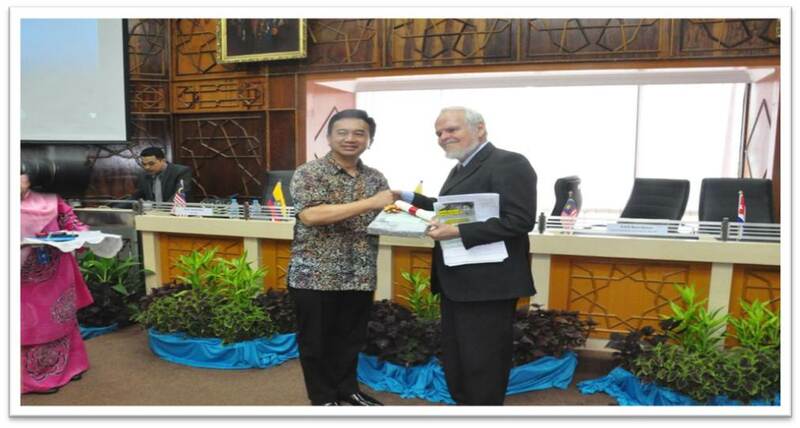 Prof. Ulung Datuk Dr. Shamsul Amri Baharuddin the Director, Institute of Ethnic Studies KITA, UKM. 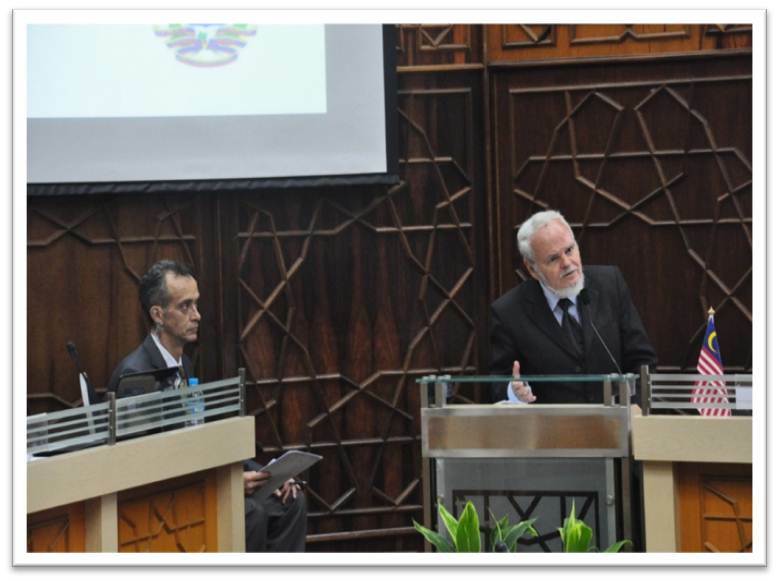 Chancellery Building, UKM March 14, 2016 – iKAL IKMAS organised it’s second Global Talk Series at the Senate Room, 5th Floor, Chancellery Building. 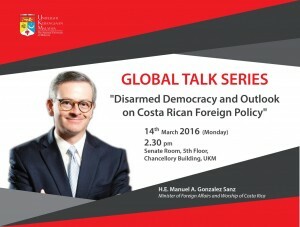 The talk aims to elaborate and discuss the Disarmed Democracy and Outlook on Costa Rican Foreign Policy. The event began with the arrival of His Excellency Manuel A. Gonzalez Sanz, Minister of Foreign Affairs and Worship of Costa Rica. 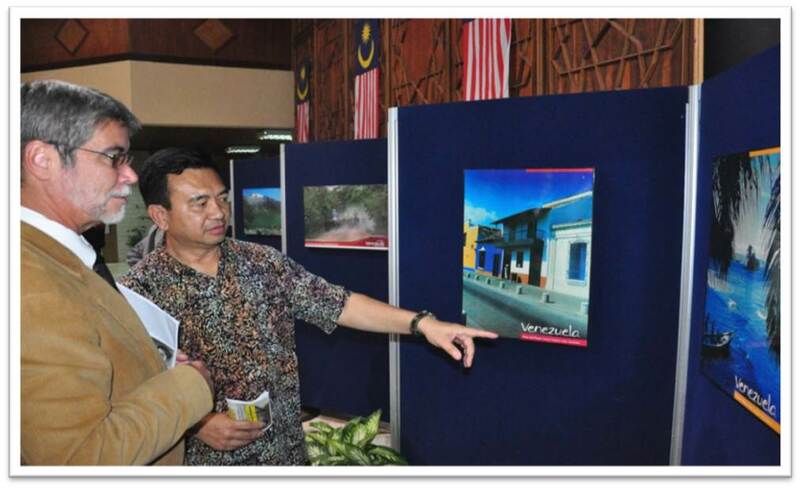 Prof. Dato’ Ir. Dr. Riza Atiq O.K. Rahmat, Deputy Vice-Chancellor UKM Academic & International Affairs gave her welcoming remarks to the guest and participants. His Excellency Manuel A. Gonzalez Sanz gave his speech on the issue and was later discussed in a Q&A session with other members of the talk. Exchange of Tokens & Photo Session concluded the event. 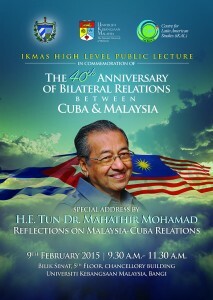 To commemorate the 40th anniversary of bilateral relations between Cuba and Malaysia, iKAL in collaboration with IKMAS has organized a program attended by special guests; ex-premier Tun Mahathir Mohamad and his wife, Tun Dr Siti Hasmah Mohamad Ali. 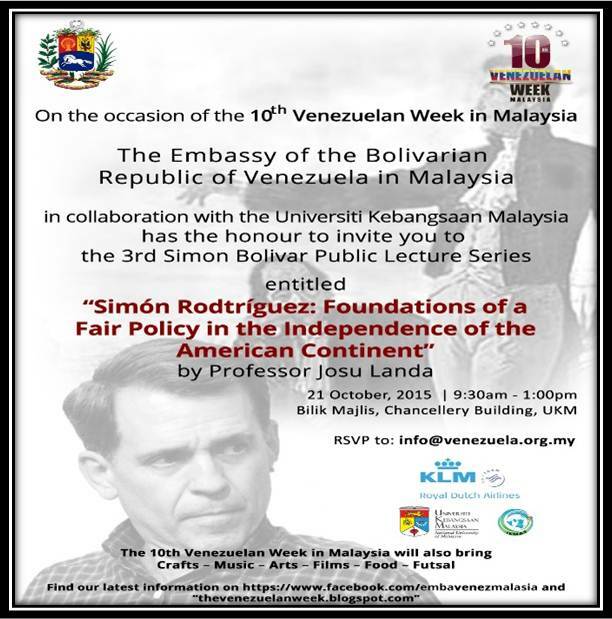 The program was held on February 9, 2015 at the Senate Room, 5th floor Chancellery building, UKM from 9:30 am to 11.30 a.m.
On October 21, 2015, “The 3rd Simon Bolivar Public Lecture Series” was held and presented by Professor Josu Landa from the National University of Mexico, Mexico. 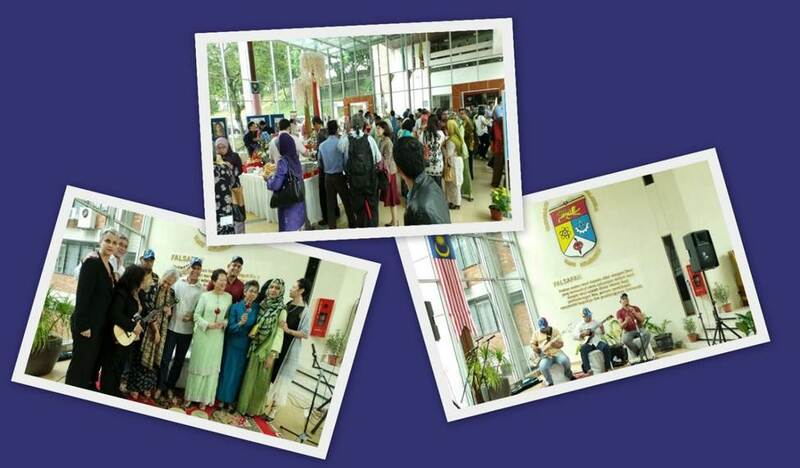 The event began at 9.30 am until 1.00 pm at the UKM Council Room, 5th floor, Chancellery building, UKM. His lecture focuses on Simon Rodriguez: Foundations of a Fair Policy in the Independence of the American Continent. The main purpose of this event is to acquire knowledge and information about the fundamental principles of justice in the freedom of the Americas. 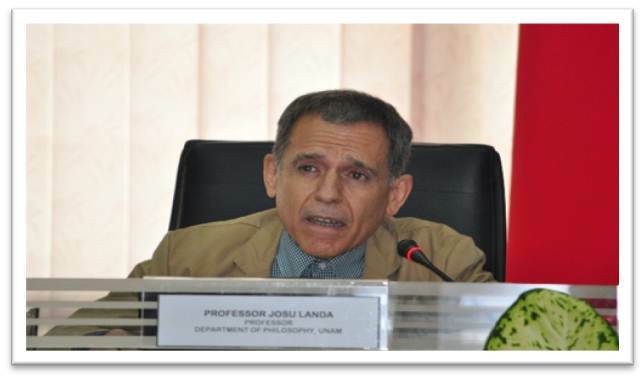 It promoted sharing of information by Prof. Josu Landa to students and campus citizens. 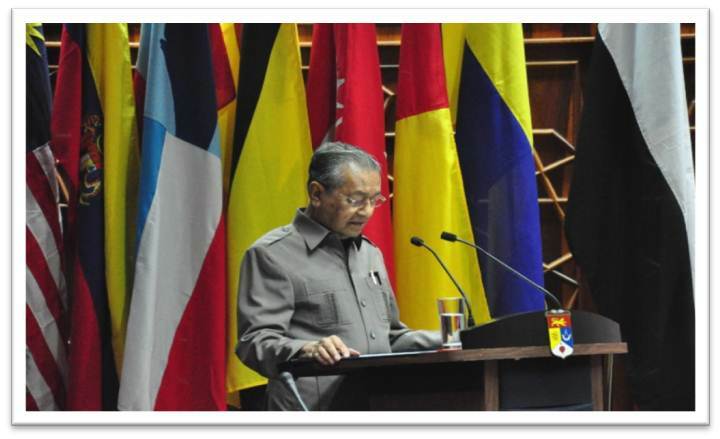 The event concluded with the Embassy of food and refreshments form both Bolivarian Republic of Venezuela and Malaysia. 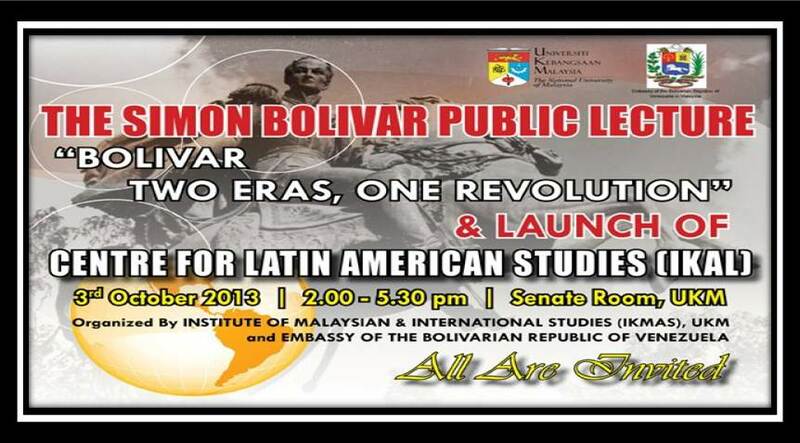 THE SIMON BOLIVAR PUBLIC LECTURE SERIES II “Simon Bolivar and Latin America. In Latin America, the ideas and attempts of integration have developed extensively since the struggle against the Spanish and Portuguese colonization. The beginning of the process of the integration of Latin America was possible through the vision of the famous South American leader Simón Bolivar. 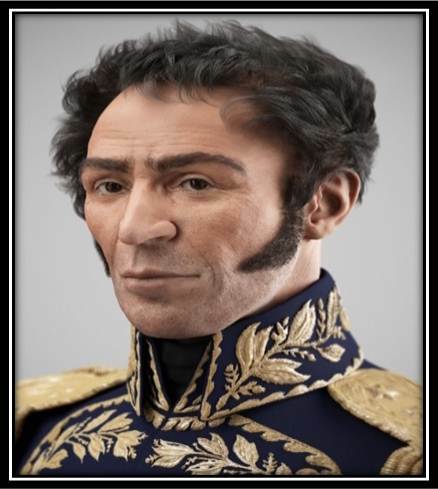 He was a Venezuelan liberator, established his belief in a truly united America in his messages to the Congresses of Angostura (1819), which is considered to be the first attempts at continental integration. 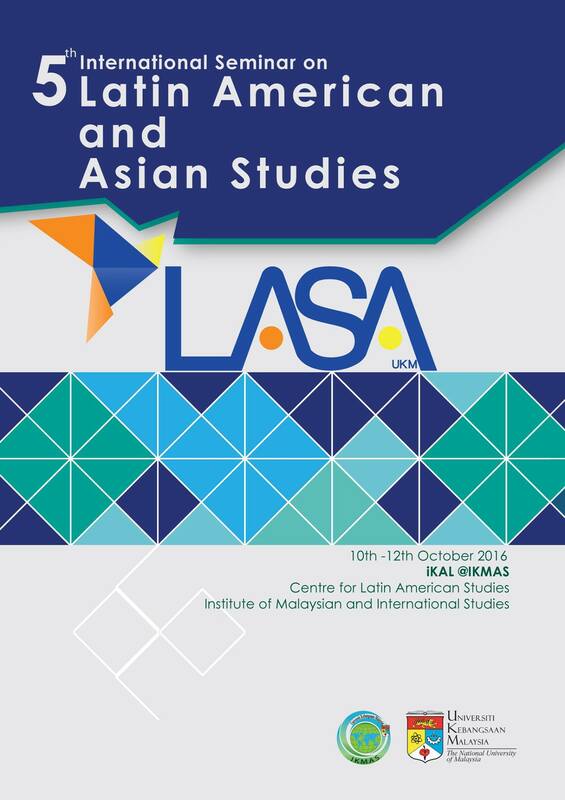 For more than 200 years, Latin America has experimented with different ideas regarding regional integration and today the idea is very much alive with the creation of the Alianza Bolivariana para los Pueblos de Nuestra América (ALBA), Unión de Naciones Suramericanas (UNASUR) and Comunidad de Estados Latinoamericanos y Caribeños (CELAC), among others, which are the new forms of alliances created over the last decade, arguing that Latin America integration is still a plausible dream of unity and solidarity. The lecture will explore the historical journey on what has been done in Latin American integration from the early days of Simon Bolivar until today. Simon Bolivar is a recognized leader in Latin America. He was the liberator of Venezuela, established his beliefs in America. 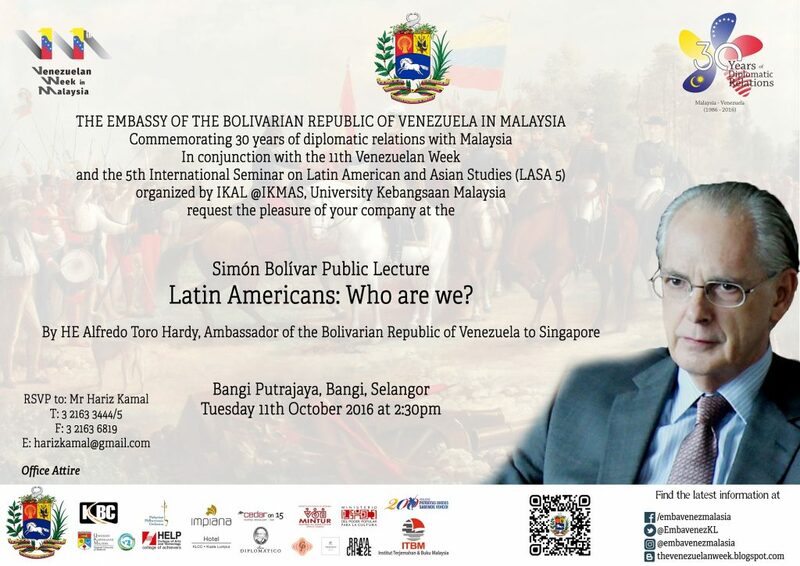 The Simon Bolivar Public Lecture “Bolivar Two Eras, One Resolution” along with the launching of the Centre for Latin American Studies (iKAL) was the first event held by iKAL. 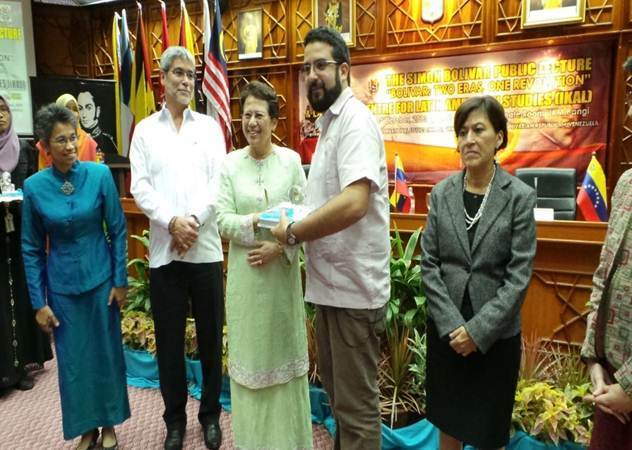 This event was organised by the Institute of Malaysian & International Studies (IKMAS), UKM and Embassy of The Bolivarian Republic of Venezuela on the 3rd October 2013 at the Senate Room, UKM.